Description: Shoot countless waves of incoming enemies and upgrade your spaceship to defeat the evil forces who threaten our galaxy. Save the Galaxy in this epic arcade shooter! 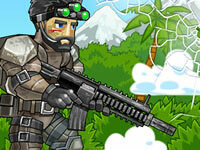 20 levels and bosses, 3 modes of difficulty, 3 challenge modes, dozens of enemies, upgrades, and pure action!